Built as part of “The Big Backyard” at the Science Museum of Minnesota. The House serves as a public environmental experiment facility, classroom, and special event space. The building is designed to function as a zero-emission building. With a energy load that is 60 percent below code, and operating a 8.8 kW photovoltaic system, the building produces more energy than it consumes on an annual basis. 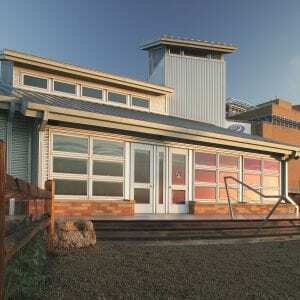 The Science House also uses a solar-electric powered geothermal heat pump consisting of four 250-feet-deep wells. Combined with passive solar design, all heating and cooling needs are derived from renewable sources. Green elements included in the design and construction, include: solar system, recycled materials, geothermal heating, locally grown materials, and certified wood.